As I mentioned Sunday we are watching Nathan’s (Josh’s younger brother) pug Chancho this week while he is on vacation. The timing worked out just perfectly. We were in the same town last weekend to get together for Holiday festivities with my family. We will then be passing back by that town on our way to Josh’s folks this weekend. Chancho is a bit neurotic but we love him, I’m betting he is like most active pugs. In addition Pippi and Chancho get along so well, like the best of buddies. They are just a few months apart and have grown up from wee little puppies to wee little dogs together. 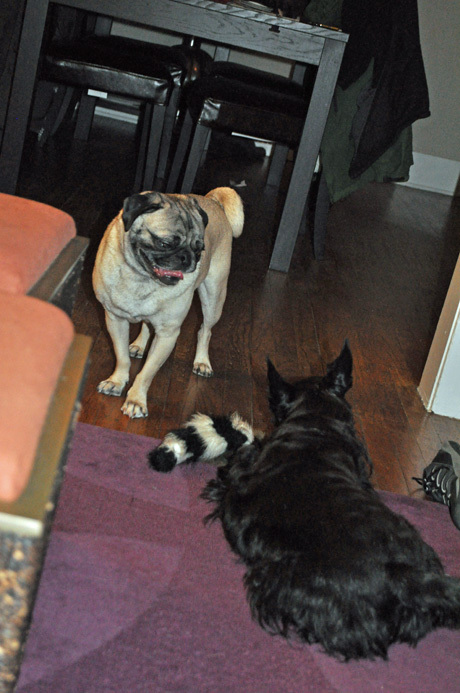 It has been fun having two dogs around, Pippi is much more affectionate with another critter to compete with. 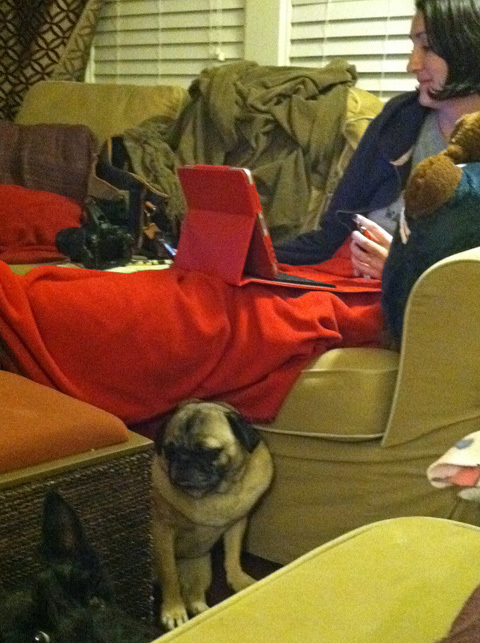 Chancho gives the love away for free, but he also sheds like a….well a Pug. Getting used to his furs all over the place has been an adjustment but how could you not love that face. This has all been good for Pippi, she is not the most socialized dog and doesn’t always play well with others. Chancho is patient and just keeps coming back for more. 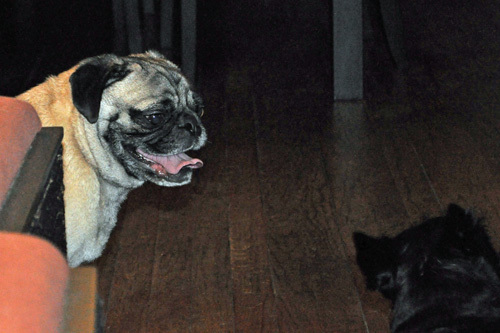 This entry was posted in dogs, Pippi and tagged Pug, Scottie. Bookmark the permalink. Aww…Pippi is having fun. Her and I always get along great. Soon you will be back to attention all to your own sis!! I wish I could see them playing together. I bet they are a hoot. Sounds like a win-win situation. Have fun Pippi and Chancho. Pippi needs to come visit Jake and Albert…they told me they’d happily help with her socialization!! 😉 Merry Christmas!